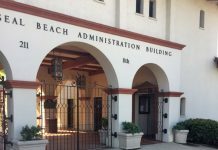 Several members of the public urged the Seal Beach City Council to save the McGaugh School tennis courts at the agency’s Monday, Feb. 22 meeting. According to a Feb. 22 staff report by Jill Ingram, assistant to the city manager, the district plans to convert the tennis courts into 63 parking spaces. However, the fate of the tennis courts probably won’t be decided until repairs are made on the McGaugh swimming pool. Pipes from the pool are currently leaking 60,000 gallons a day into the ground under that area of the campus. The council voted unanimously to direct Seal Beach staff to determine which pipes are leaking and to come back to the council with cost estimates for repairing the leak. The council also directed staff to pass along to the school district a petition from residents asking that the McGaugh tennis courts be saved for use by the public. 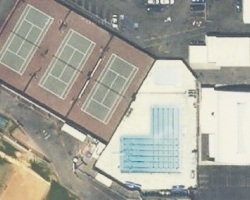 Complicating matters is the fact that while the tennis courts and the pool are used by the city of Seal Beach, the property belongs to the school district. Staff members expressed concern that going beyond a repair of the leak would require the city to get approval from a state architect for changes to school property. Ingram said Seal Beach staff was working with the school district to develop a master plan for the McGaugh school site. School District Superintendent Greg Franklin told the Sun Newspapers on Monday, March 1, that the district used neither the swimming pool nor the tennis courts for educational purposes. He said the district does not have money for those facilities. “That whole corner of the campus has issues,” he said. 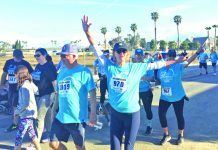 Franklin said he had received a letter from Seal Beach Mayor David Sloan asking that the district and the city of Seal Beach plan the site together. During the public comment segment of the council meeting, Alison Cotter said that she sympathized with the district’s need for parking, but said the district should reconsider. She said the board was told the tennis courts were not needed. She said over the weekend prior to the council meeting, over 200 people signed a petition to save all three tennis courts. Cotter also said the issue of the McGaugh pool should be addressed before anything was done to the tennis courts. City Engineer Michael Ho doubted the tennis courts could handle the weight of vehicles with water undermining the area. “That’s a question,” Ho said. TGR Geotechnical, Inc., the district’s consulting firm, recently recommended installing a French drain at a cost of $125,000 to address the leakage from the pool. Ingram’s report said the city engineer was looking for an alternative to draining the water onto the sports field. Ho said city staff does not know how the McGaugh pool was designed. The district has apparently not provided Seal Beach staff with the design plans for the pool. Ho said a 2008 study concluded that the cost of repairing the pool was likely to be greater than the cost of replacing a pool. The report Ho mentioned was a September 2008 report by Greg Cannon, a project manager with Rowley International Inc., that concluded the cost of refurbishing the McGaugh pool would be $3,747,400. In fact, the City Council on Jan. 26, 2009, directed staff to begin negotiating with Exxon Mobile Corporation to either purchase or lease the Marina Park property as the site of a new pool. It is not known when or if the city will acquire that property. At the Feb. 22, 2010 meeting, Councilman Gordon Shanks said he had a problem with draining the leaking pool water onto the baseball field. Councilman Charles Antos said he didn’t believe a French drain would do the job. “Somehow or other, the water needs to be stopped,” he said. Antos also said the council had never taken action concerning the McGaugh tennis courts. Councilman Gary Miller said it was the city manager’s responsibility to let the council know if the city was going to lose recreational facilities. Some people in the audience applauded when he said those words. Antos said it would be difficult to build a new pool on the McGaugh property because the site belonged to the school district and the project would have to go through the state architect. Mayor Sloan suggested a bare minimum repair on the pool. He said it had been more than a year since the council discussed other locations for a swimming pool and they were not available. 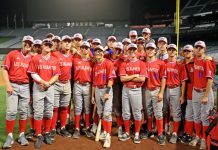 Shanks wanted staff to give the pro-tennis court petition to Los Alamitos Unified and to provide a copy to the Seal Beach Parks and Recreation Commission. Both Sloan and Shanks said the tennis courts should be kept open to the public.